I won Ellen Chester's blog giveaway and the charts came today! I just love them - they're so pretty! The fabric is 32 ct. Vintage Buttercream by Lakeside Linen - it's a beautiful color! I just love my new Nook. It's awesome. I love the fact that unlike a Kindle I can download books from the library on it. My library in Florida (still have my card) just added over 200 ebooks. I was so excited to see that. I just started reading The Girl with the Dragon Tattoo, which I got from the library. The case I got for it is a M-Edge Platform Jacket with light. Very nice linen choice for Simple Joys. Can't wait to see the finished piece. I remember when my sweet little one was in the "home destroying" phase. He once overturned a potted plant! I was sucking potting soil out of the carpet for weeks! It's a fond memory now as I am soon to be a grandmother. Glad to hear you were a winner on Ellen's blog. The charts you picked look really nice. I got the charts that I picked from your giveaway. I am very happy with my choices. 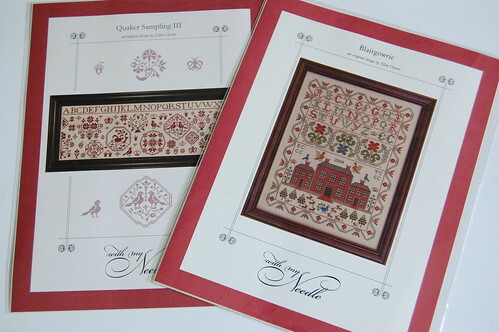 Wonderful charts, and great linen choice on Simple Joys! And love your new toy - I really, really need to get me one of those!! Love that linen on Simple Joys--vintage Buttercream, you say? Hmmnn...the nook looks great! I go through phases using my kindle--I'll use it a whole bunch one month and then not at all for 3 months. Weird, huh? I think it's because I read a lot of non-english books that aren't available on Kindle, so I mostly get into it when I'm doing a novel kick. Also, I read a good amount of design books and stuff which I buy or they come from the library. You lucky think to win those charts! I love the Quaker Samplings III. And I just bought the Simple Joys pattern, and I am going to convert mine to all HDF silk. I have a Kindle and love it, but when the Nook came out, I was like, aw, man, I should have waited! That's great that you can download books from your library! Maybe Amazon will do that soon too. I have been seeing these Nooks and Kindles on other blogs and feel like I just have to jump on the eBook bandwagon. But I have a dilemma - I love the feel of the paper and hardbound book and the smell of them. I'm a nut, I know! Maybe after I complete my thesis and graduate in the fall I will reward myself with a Nook...hmmm! Congrats on the win! SJ looks lovely! I loved The Girl with the Green Dragon Tattoo. The Girl Who Kicked the Hornet's Nest arrived yesterday and I have already read 100 pages. I'm sad that this is his last book. I have an iPhone and a laptop, but don't have much of an interest in an eBook reader. Many of my books are autographed (hard to do that with an ebook). Ebooks are now more expensive than a paperback. And most importantly I read in the bathtub! Not the best environment for electronics. Maybe I'll try some ebooks from the library when I get an iPad. I love Simple Joys. Such a pretty design and I love your fabric choice. I always think you have a good eye for fabric. :) Congrats on your win! Both are beautiful designs. That M-Edge case is awesome! Is the light attached? That is great about being able to borrow electronic books from the library. I have been checking into that option too. My library doesn't offer that service, but I found one that does that will allow me to pay a fee for a card since I am not a resident. Let us know how you like The Girl with the Dragon Tatoo. I have heard it is hard to get into at first, but that it is really good. Those three year olds seem to have a different opinion about 'clean' ;0) Enjoy! She'll be eighteen very soon. Congrats on your win of the charts and congrats on your new Nook. What fun! Kudos on a great giveaway! I love the Quaker Sampling III...very pretty! I love the Vintage Buttercream too...keep on stitching! Congrats on winning the charts. It's always fun adding to your stash. Glad to hear you're enjoying your Nook. I've been tempted to buy either the Kindle or the Nook. Our library doesn't have e-books. Bummer. Lucky you, winning Ellen's giveaway, getting a Nook (not to mention that other gadget), and stitching such a beautiful piece. I love the colors in that piece! 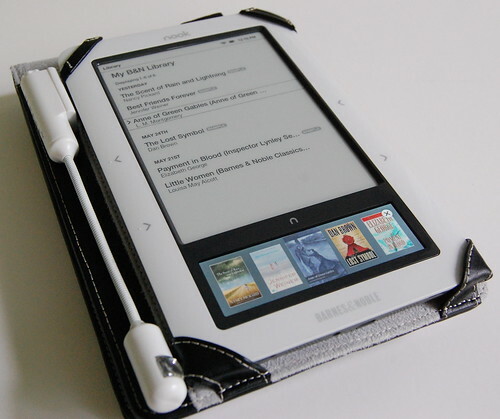 I have a Sony Reader and I love it too because of its functionality. Kindle is too limiting. YAY on your win from EC. Love those charts! You are having so much fun Nicole and I am so happy for you! Congrats on winning the beautiful new patterns! Your Nook is something I wish I had with the jacket and light too! It must be so nice to have!! It sounds like your summer is off to a great start and I couldn't be happier for you!! congrats on your win! Ellen has wonderful things. Love the new notebook, and your stitching is great too. 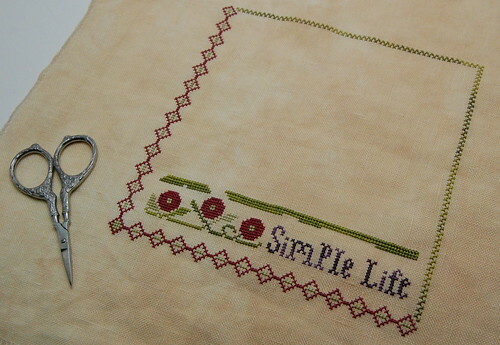 Great Progress on Simple Joys, it looks wonderful. Congratulations for winning at Ellen's blog, those charts are gorgeous! The nook looks great! Continue to enjoy it! Great win, Nicole! Enjoy those charts. I just love that Vintage Buttercream fabric!!! Simple Joys is looking a treat. Gadgets, gadgets, gadgets. There's so many coming out lately. We've just had the iPad released in Australia yesterday. Too many tempting toys out there! That was a fantastic win from Ellen's, Nicole!!! Those charts look just like you! I believe Kindle does have the capacity to download ebooks from any source...I'll have to look into that. Miss you and looking forward to our having lunch and fun when you get back for a visit. Give my love to Matthew!! My Sister in Law has a Nook...I have a Kindle. I love it and I download books from the library all the time. You just have to change the format, not to hard. It has many other features too...I use mine as my daytimer also!